The bar has a 1/4"-20 threaded hole on each end, and both handgrips have 1/4"-20 threaded holes on top and bottom for a total of six accessory mounting options. Additional accessories can be mounted on the handlebar with 22 to 25mm rod clamps. 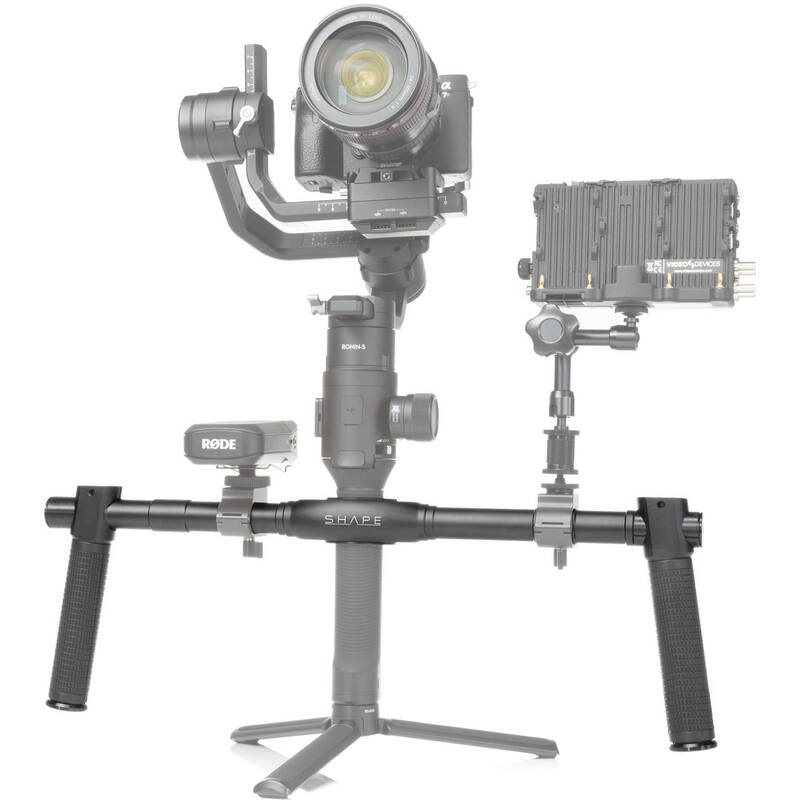 Mount the gimbal on top or hang it below the bar in inverted mode. The bar and handgrips align with the gimbal base to rest steadily on a flat surface during a break or when calibrating. Box Dimensions (LxWxH) 21.6 x 8.7 x 5.6"
Dual-Grip Handlebar for DJI Ronin-S is rated 4.0 out of 5 by 2. Rated 3 out of 5 by Chris from Mostly Good Its overall an OK product. the actual handles that you hold, even if screwed tight, slip quite a bit. It makes the Ronin so much lighter, which is a huge plus. Overall its just OK. Rated 5 out of 5 by Caitlyn from Exactly what I wanted Was exactly what I was looking for to accompany my Ronin S, its sturdy and cheap! my only concern would be the longevity of the handles. has anyone tried attaching the ready rig? Has anyone tried the setup in photo #3, but rotated the handles upward so that you are holding your hands closer to the CG of the camera? looks reasonable be you are not showing any cord from the Rode mic receiver or the monitor... how does that work? You would connect both the Rode Mic and the Monitor to the camera in the normal fashion. You will just want to make sure you have ample room for the cables not to get in the way of the motors on the gimbal.